When publishers give away games, it often feels like the digital equivalent of a box marked “Free!” on the side of the road—inevitably you open it up to find a VHS copy of Captain Ron, a pair of ripped sweatpants, and some scratched-up Neil Diamond records. Case in point: Last week Deep Silver gave away copies of Homefront and like...why? But occasionally a freebie comes along that’s actually worth nabbing. Cue Ubisoft, which this week is giving out free copies of Assassin’s Creed IV: Black Flag—either the best of the Assassin’s Creeds or, if you’ve been in this a long time, maybe the second-best (after ACII). Okay, some people really love this year’s Assassin's Creed: Origins and might say third best. You get the idea though. It’s good. The first of the post-Desmond Assassin’s Creeds, Black Flag ditched the dour tone of ACIII for a pirate-themed romp through the Caribbean. In some ways Black Flag moved away from the core tenets of the series—climbing was sidelined for instance, due to most Caribbean “cities” topping out at one or two stories tall. The change felt refreshing though, especially in the wake of three Renaissance-era Ezio games and then the disastrous ACIII. Oh, and the ship-based combat was so good Ubisoft brought it back for AC: Rogue, AC: Origins, and is even spinning it off into a standalone game (2018’s Skull and Bones). 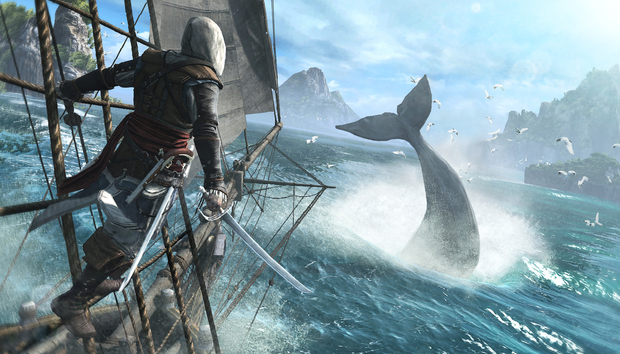 If you’ve never played an Assassin’s Creed, Black Flag is a pretty good place to start. And if you have? Well, chances are you already own Black Flag, but if not you should absolutely take advantage of Ubisoft’s generosity and rectify that situation. Four years on, Black Flag is still the high-water mark (no pun intended) of the series for me, and the only Assassin’s Creed I’ve ever bothered to reach 100 percent completion. As someone who’s played all bazillion games in the series or whatever, that’s about the best recommendation I can give. You’ll need a Uplay account, which is the only sticking point I can think of. If you’ve got one though, or don’t mind installing Uplay on your PC, head over here and claim your copy—the deal’s available through December 18.